Visit Miami's magnificent coastal sites while taking in the gorgeous Miami skyline, the Port of Miami, Fisher Island, Miami Beach, and the homes of Star Island on a 90-minute sightseeing cruise. You'll have plenty of time for shopping in Bayside Marketplace Mall, time to relax at South Beach or enjoy a meal on Ocean Avenue. Round-trip transportation from Orlando is included. You'll depart Orlando in the early morning and enjoy a continental breakfast during the drive down to Miami. Your first stop will be at the waterfront Bayside Marketplace Mall where you'll board your boat for the cruise. 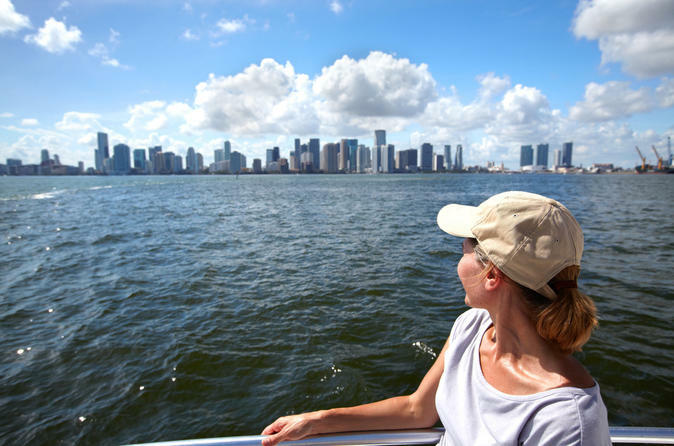 Sit back and relax for an fully-narrated, bilingual sightseeing cruise along scenic Biscayne Bay. See Miami's spectacular coastal sites including the beautiful downtown Miami skyline, the Port of Miami, Fisher Island, Miami Beach and "Millionaire's Row" - the homes of the rich and famous. Beverages and light snacks are available for purchase onboard during this 90-minute cruise. In the later afternoon travel over to the city of South Beach. This unique area is often seen in movies with the pastel colored buildings and stunning white sandy beach. You will have some free time to enjoy the beach, shop Lincoln Avenue, enjoy a restaurant on Ocean Avenue or just people watch. This is an awesome way to see the sights of Miami.